One fruit you are unlikely to see at your local grocery store is the Pawpaw. Asimina triloba is our largest native fruit, with a flavor that is described as a combination of pineapple, banana and mango. Its rarity in the market is due to its short storage life . Pawpaws fall off the tree when ripe, and will only last two to three days thereafter. They are edible for a day or so after the skin turns black. The soft interior can be eaten with a spoon, which is why one of the common names is custard apple. Other common names include hillbilly mango, Quaker delight, and Hoosier banana. Fruit is kidney shaped and can vary from egg size to palm size. I grew up hearing the rhyme about “Picking up pawpaws, putting them in a basket, way down yonder in the pawpaw patch.” Despite the fact that they are native to more than half the states, I was in my twenties before I saw my first one. At the time I thought the fruit smelled like bubble gum. A crushed leaf has an unappetizing odor similar to asphalt. It took a little time for me to adapt to the fruit's pudding-like texture, but I didn't like coffee or olives the first time either. Pawpaws have unimpressive burgundy blooms that strongly resemble (in my mind, at least) miniature Carolina Sweetshrub, Calycanthus floridus. The understory trees remain short in stature and thrive in filtered shade cast by larger trees but bear more fruit when sited in full sun. They spread by suckers, so develop into thickets in the wild. It takes at least two varieties to ensure cross pollination and fruit production. Blooms are pollinated by flies, so several sources recommend throwing dead fish or road kill near the tree trunks to attract pollinators. (I couldn’t make this stuff up.) Fruit may form but if pollination is lacking it will fall off soon after formation. The baby fruits look like a miniature bunch of bananas. Purdue University has a website with excellent photographs of the tree, foliage and fruit: https://ag.purdue.edu/btny/ppdl/Pages/POTW_old/9-23-13.html . Kentucky University has a pawpaw breeding research program that encompasses over 2,000 trees and they also house a gene bank for the species. Pawpaws are one of those foods that have been around forever (American Indians ate them) but engendered little interest until recent years. Now they are a novelty item (think goji berry), even featured in the May/June 2018 issue of The American Gardener magazine. I found pawpaw culture intriguing, and purchased several cultivars and an unnamed seedling three years ago. They require maturity to start producing, so I’m biding my time, sitting in the Mary Snoddy orchard with my harvest basket. 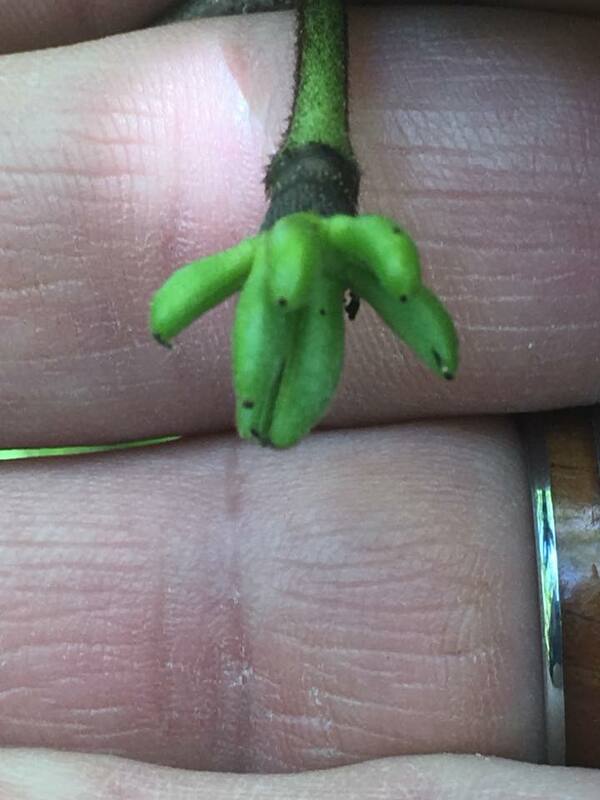 My friend, Sonny Stokes, shows off a tiny cluster of baby pawpaws on his tree.